Patel S, Cain R, Neailey K, Hooberman L. (2017). Recruiting General Practitioners in England to Participate in Qualitative Research: Challenges, Strategies, and Solutions. In SAGE Research Methods Cases. 2017. Available here. Patel S, Cain R, Neailey K, Hooberman L. (2015). General Practitioners’ attitudes towards Online Patient Feedback, WMG Doctoral Research and Innovation Conference. IMC, University of Warwick. 30th June to 1st July 2015. Cain, R., Payne, S., Mackrill, J., Sadeghi, M., Patel, S., Pandharkame, S., Potter, R., Vuong, K.(2013) ‘Participation in healthcare environment engineering: the story so far…’ European Conference on Design 4 Health, Sheffield, UK, July 3rd-5th. Baby Skin Integrity Comparison Survey (BaSICS), Poster Presentation at the Challenges for Healthcare Event at the Festival of research, 2nd July 2018, University of Salford. More here. 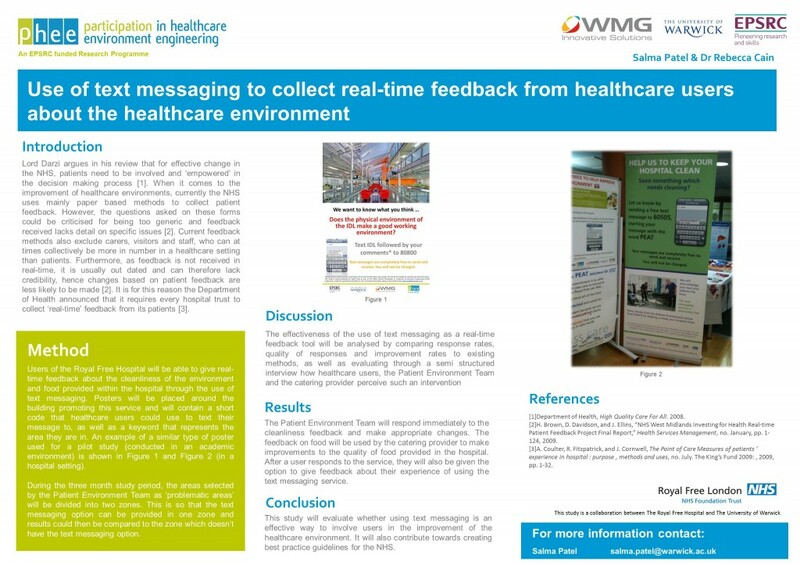 The use of text messaging to collect real-time feedback from healthcare users about the healthcare environment, Poster Presentation at Health Research @ Warwick, 29th January 2013, Warwick Medical School Atrium. Copy of poster here. Recruiting participants for research – do we need a public participation research panel? at Pat Thompson website, published in Feb 2016. 5 tips on getting your 1st journal paper published at The PhD Life, published in Jan 2016. I’m an academic and desperately need an online presence, where do I start? at The LSE Impact of Social Sciences. Recorded as one of the 10 most popular posts at the LSE Impact blog, with 9,684 views. Presented ‘An overview of Healthcare Apps in the UK‘ at the BCS Medical Apps Seminar on Tues 18th of Oct 2011 in Chelmsford. Presentation & delivery notes available here. I was invited to speak about the role of social media in academia at the event: TV, Parliament and Bond Villains: Making an Impact with your Research on Monday 21st May 2012, 10-4pm, at the Wolfson Research Exchange at The University of Warwick. Will be presenting (delayed to July) ‘Healthcare Apps in the UK‘ as a webinar for the the staff at The James Cancer Hospital and Solove Research Institute at the Ohio State University. Guardian HE Network Live Chat: Research communication: building good university-media relationships, 31st of Aug 2012.